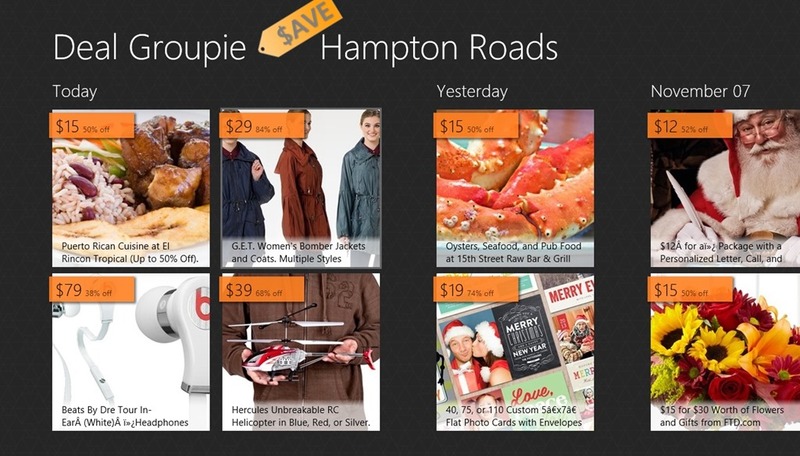 Deal Groupie is a Windows 8 Deals App. You can use it to get best Deals in Shopping, Beauty,Travel, and many other mostly searched categories. This Deals app will find deals available from some of the best deals websites like Groupon, BuyWithMe, Dealfind, TeamBuy, and many others. This Windows 8 Deals app can help you to get Deals from USA and Canada.You can set it to show deals for any of the cities in these countries. Deal Groupie is freely available in the Shopping category of the Windows Store. 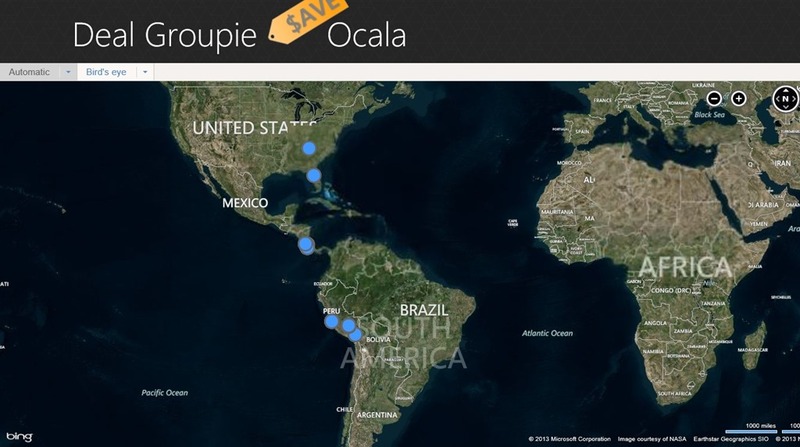 Along with all this, this Windows 8 Deals App will also allow you to view the places where the deals are available on the map. 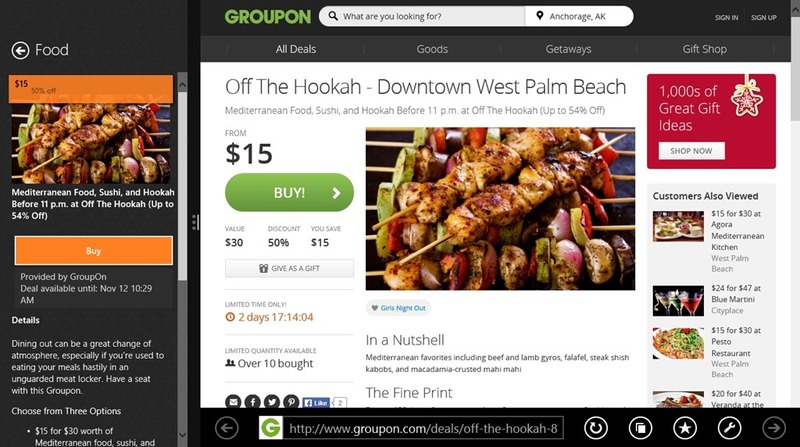 You even have the ability to share the deals over the Internet using the Windows 8 Share Charm. As you land into this Windows 8 Deals app, you will be asked by the app to select the locality for which you want to get deals. You can select to get deals from USA and Canada. Select your City and Province and the app will provide you with a list of deals that are available there. Deals would appear categorized according to the Dates. Along with the option to get the deals from your preferred location, you also get the capability to view and locate the places on the maps that are present within the app. 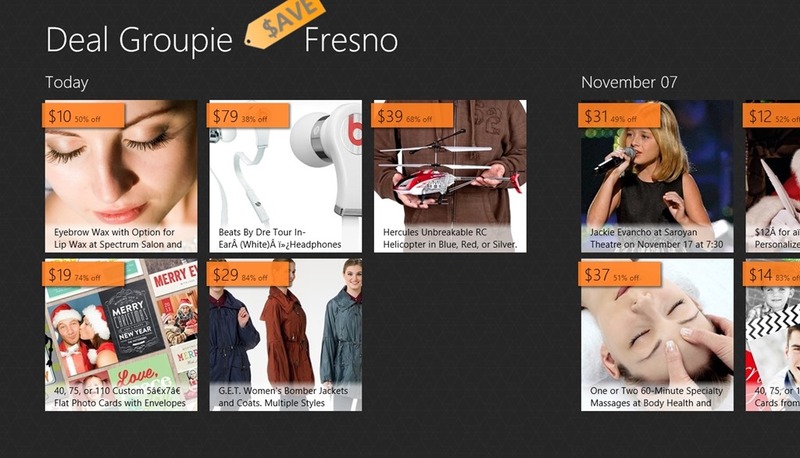 For that you have to use the bottom flyout of this Windows 8 Deals app. To get the bottom flyout, right click anywhere on the app. From there, use the Map View option to get the location map. The locations will be shown by blue colored spots. Click on any of the deals that are available in this Windows 8 Deals App, and it will open showing you all the details about the product that you need to know before buying the deal. Things like till when the deal is applicable, for how many people it can be used, and other similar kind of stuff will be shown. Use the Buy option, and this Windows 8 Deals App will open the Deal in the Windows 8 IE app that is available on your Start Screen. Also Check Booking.com, Deals Near Me, and Buy.com. 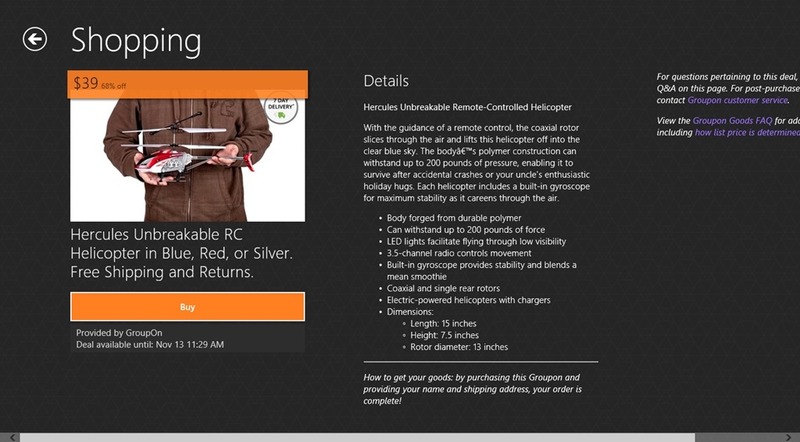 Nice Interface: The user interface of this Windows 8 Deals app is quite nice. Freely available: The app is freely available in the Windows Store. View the deals from USA and Canada using this Windows 8 Deals app. Deals are available from websites like BuyWithMe, Groupon, TeamBuy, Dealfind, and many others. You have the capability to buy the deal. View the locations for which the deals are available on the map. According as my experience, this Windows 8 Deals app is quite nice. You should definitely try it. Share your experience with us.